Edition forty-five and it's still alive. Let's start this Grab Bag out right: How did carebear Reaver Revaer react to losing his mining vessel? ...Not particularly well. 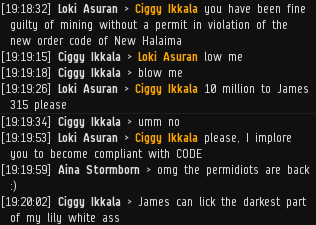 Some miners are smart enough to get a permit after their first gank, but others have more issues to work through. The rebels instinctively dislike the joy shown by Agents of the New Order each day. If we're celebrating ourselves on MinerBumping, it's only because that's what people do when they enjoy a victory. It's not our fault that we have a constant series of victories every day. Someone forgot to tell grand admiral PWN that we retired the "I wasn't AFK, I was just..." square on the Miner Bingo board last year. As for our competition, I'd direct him to them, but we don't have any. 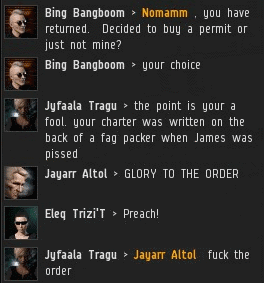 The name of James 315 provokes many different reactions in highsec. Most of them are good. Some, less so. It remains the most effective litmus test in EVE today. 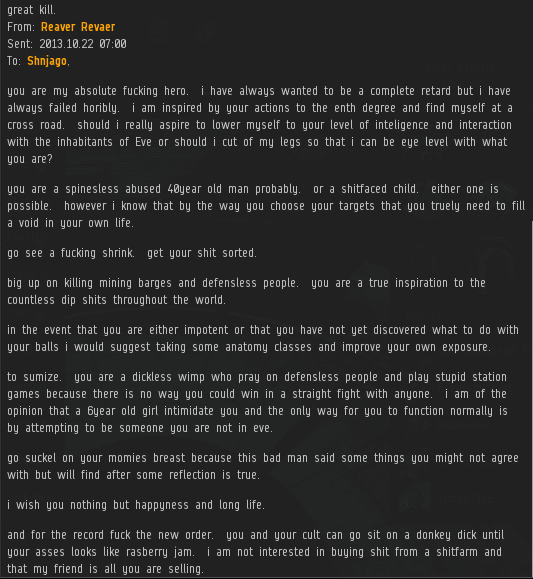 Cash West asked me to take pity on new EVE players. But that's exactly what we're doing. The real new players--not the "new players" who have been playing for five years--catch on quickly, because the tentacles of bot-aspirancy haven't gripped them so tightly yet. Case in point: I'm pleased to report that Cash West purchased a mining permit a few days after sending me this EVEmail. Contrary to rebel gossip, I was not intoxicated when I wrote the Code. In fact, I've never seen things so clearly. MedicineMan Huren opted against going the Reaper Revaer route, so he kept his tears short and sweet. Thanks for taking it easy on our bandwidth, MedicineMan. 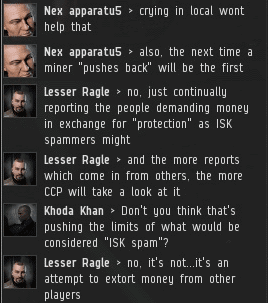 According to the official EVE website, "ISK Spamming" is when RMT'ers advertise their services. Unlike some other organizations I could mention, the New Order opposes RMT with all of its power. 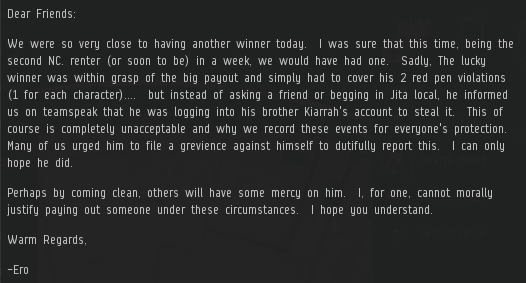 CCP would have an easier time tracking down RMT'ers if the "report isk spam" feature weren't being abused so frequently by the rebels. 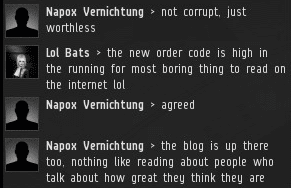 I'm not sure what pomka17's EVEmail meant, but it didn't come enclosed with 10 million isk, so he's still fair game. DK Duncan is right about one thing: In EVE, you never stop losing ships. That's because EVE is a spaceship combat game. Only fly what you can afford to lose, or purchase an Invincible Stabber. I'm widely credited with keeping it real. As the Saviour of Highsec, reality maintenance is one of my most important jobs. Though Erotica 1 would love the publicity that comes from someone winning big in a bonus round, she respects the EULA too much to let an admitted account-sharer win. That's exactly the kind of integrity you'd expect from the New Order's biggest shareholder. I have translated pomka17's message, James. He said, when translated to English: "I was mining in Highsec, which turns out to be New Order Territory that requires a permit. Direct Intervention destroyed my ship without warning or asking if I was AFK. He did neither inform me that I required a permit nor attempt to sell me one before attacking me. He shot first and then contacted, when it should have been the other way around." Oh, OK. Good to know there wasn't a problem, then. That's Savior for "Working as intended." As the trigger man for Heavy Rayne's bonus room I can assure you that he did, indeed, have a few skillpoints remaining. Though the skillpoint loss for one or even a small handful of pods is insignificant, in his successful bid to break the bonus room record, Mr. Rayne lost approximately 17 million SP--just about half of his original 35 million. Though he wasn't able to turn his efforts into a big win this time, I imagine that his record should stand for some time. It's a shame that he won't be able to purchase a new character with his winnings as he was planning. It was heartrending to see him come so close and then fail right at the end. It doesn't pay to break the law. But what happened to the POS? Tell us about the POS!!! We want more on the POS.